I love this recipe because you can make any cream soup you want from it. It has a wonderful base. It is adapted from Bob Pastorio’s Cream of Anything Soup. I found it through A Cook’s Book Food Forum (mac cooking software forum) which I have been part of for a few years now. Cook the pancetta until crisp and set bacon aside. I drained the fat to reduce some calories (there are plenty to follow!). Next, melt the butter in a pan and cook the onions and diced carrots until the onions are translucent but not browned. Add flour and stir to cook. Whisk in the chicken broth slowly, stirring briskly to break up any lumps. Bring to a boil, reduce heat and cook for 15 minutes. Add in the broccoli (or whatever you choose), diced ham, baby potatoes and cook for another 20-30 minutes over low (do not put the lid on it fully, keep it off center a little to vent so it does not boil over. Stirring occasionally. Just before serving add in the heavy cream and add the cooked bacon. Season with salt if needed and serve with biscuits or fresh crusty bread. 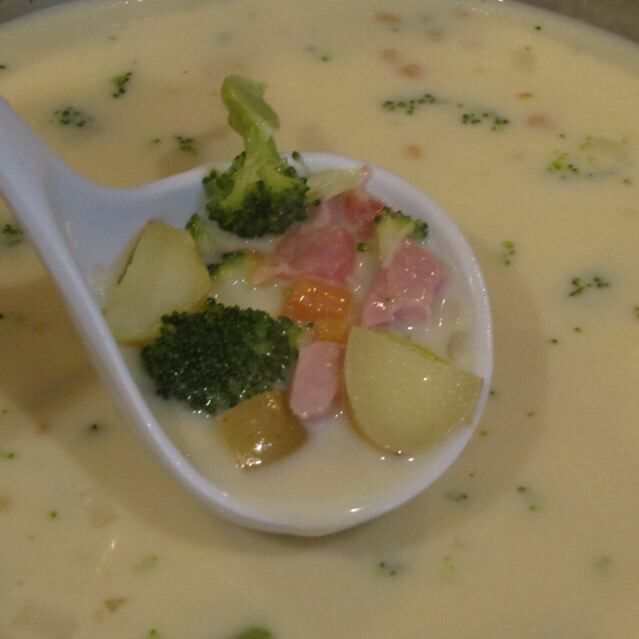 Categories: Main Dish - Soups | Tags: Cream of Broccoli Soup | Permalink. I remember walking along the streets of Salzburg, Austria in the winter season and sampling the roasted chestnuts that street vendors sold. It was a nice treat for the winter season. In the United States, it seems, we only sing about chestnuts roasting over an open fire, but few have made them or even tasted them. As I went through my local market to buy the ingredients I needed for Christmas dinner, I saw them and they had a helpful sign that gave instructions on how to roast them. I took a quick picture of it, because I knew in the hustle and bustle of Christmas preparation I would forget the specifics. 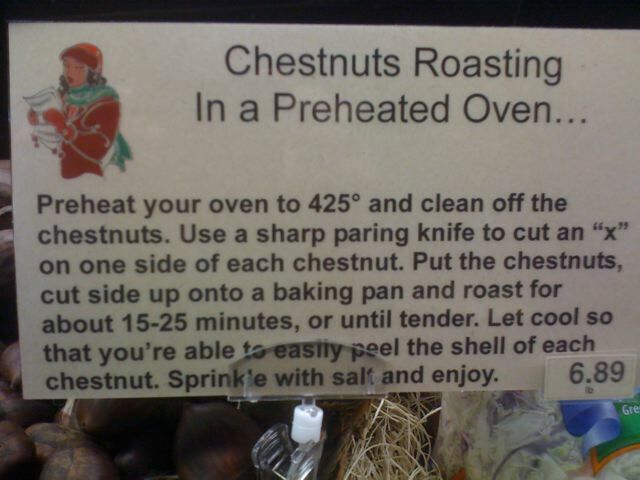 Preheat your oven to 425 F and clean the chestnuts. Carve an X with a knife, being sure to puncture the skin of the chestnut completely (I found this easiest to do at the top of the chestnut, where it tends to be softer than the rest and has done the job for me — other sites recommended on the side, but I came close to cutting off my fingers and I am rather attached to them thank you!). Place the chestnuts in a pie pan and bake for 25 minutes. Allow to cool and peel while still warm. You can serve them with melted butter and salt or cinnamon. My husband finds them a little tedious to peel, but once peeled finds them delicious. Try them and you will like them, but they are a bit pricey. Well worth it for an occasional treat. 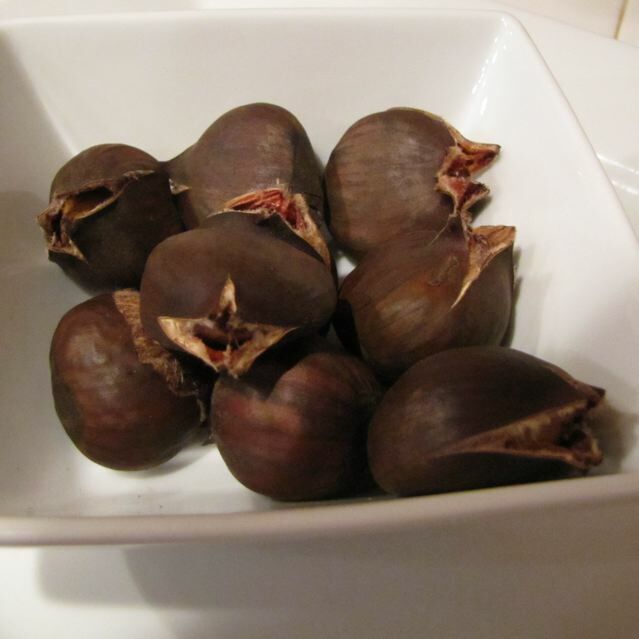 Categories: Christmas, Holidays | Tags: chestnuts, Roasted Chestnuts | Permalink. Here is my favorite egg casserole to bring to functions. It morphed from a quiche recipe into just an egg casserole without a crust. With a tweak here and there it became my own. I often make two casseroles, using up one package of the spinach between both. Spray a 9x13x2″ baking dish with non stick spray. 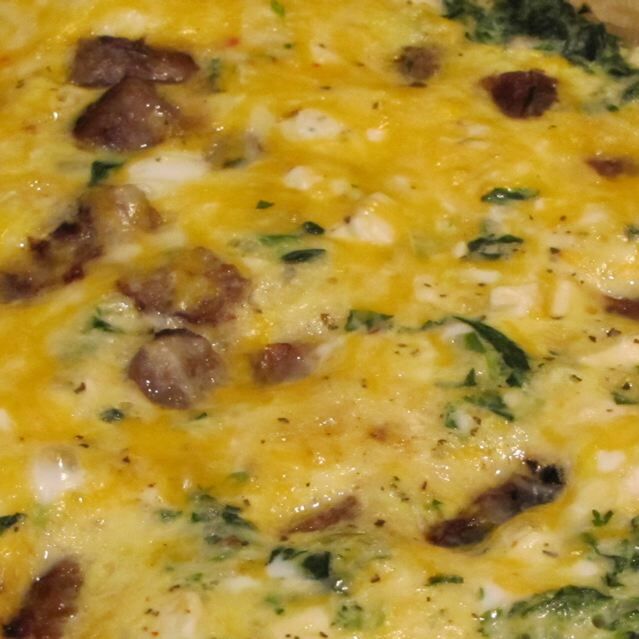 Layer the bottom of the casserole with the spinach, feta and cheddar cheese, cooked sausages, and mushrooms if desired. In a separate bowl whisk together the eggs, milk, and salt and pepper. Pour over the casserole and stir gently to make sure the ingredients combine some. Bake at 350F for 20-35 minutes. Check from time to time to ensure the eggs are cooked. Cover with foil and let stand about 10-15 minutes. Serve. Categories: Breakfast, Breakfast - Eggs | Tags: Egg Casserole | Permalink. Many of you are familiar with Cheese Fondue which has its roots from Switzerland. 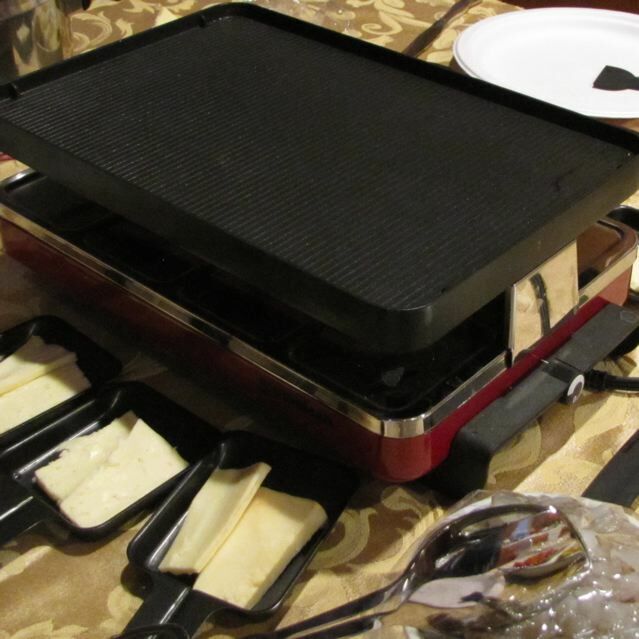 Raclette is another Swiss innovation. It is melted cheese (broiled) that is served over boiled baby potatoes and accompanied by pickled vegetables, pickles and olives. 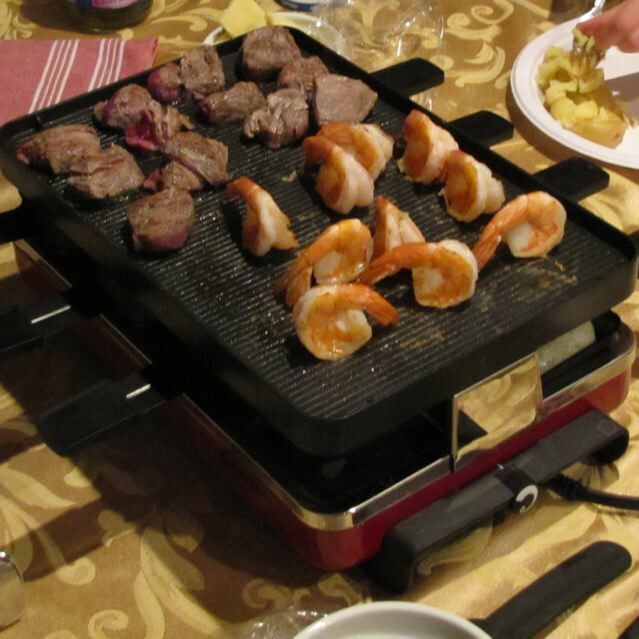 A few models of Raclette ovens have a grill pan on the top of the broiling elements where you can cook meats, seafood, bacon or grill vegetables if so desired. My parents gifted us with a wonderful Raclette oven a few years ago (link) and we have enjoyed it over the past few years. My daughter especially likes shrimp and though I know that shrimp and cheese do not typically get served together I do make some for the kids. There is even a Raclette cheese. I buy mine at Trader Joe’s, but you can find them at well stocked grocery stores from time to time. I have had success in freezing the cheese too – to keep it until the day I make it. 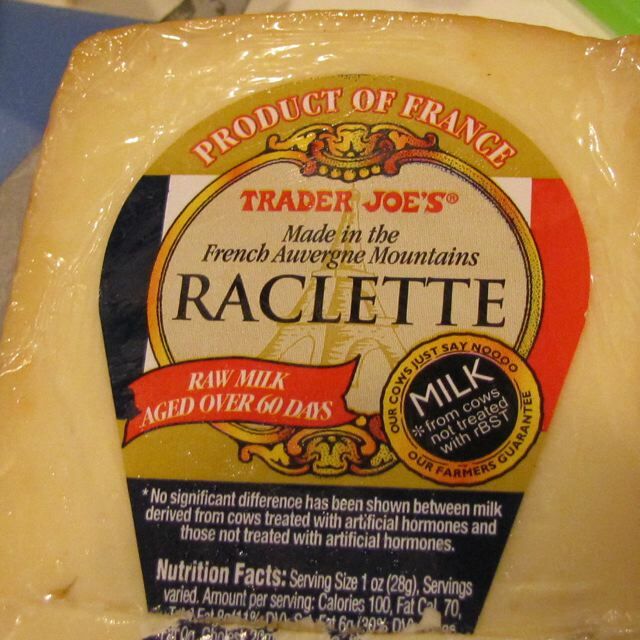 If you cannot find Raclette cheese Gruyere will make an excellent substitute as it is similar in taste and texture. Preheat the Raclette oven for about 10 minutes before using. The cheese is melted in non stick trays under the broiler. The meats and vegetables are grilled above on the grill pan if your Raclette oven has that option. Melt the cheese and serve over boiled baby potatoes that you have roughly mashed with your fork. Season with caraway seed if desired, and dried minced oregano. Serve with pickled vegetables, roasted bell peppers, pickles and an assortment of olives. For meats I cooked Filet Mignon cut into 1 inch pieces and jumbo shrimp that had been peeled and cleaned. Categories: Christmas, Ethnic, Ethnic - German, Favorite, Holidays, Main Dish, Main Dish - Potatoes | Tags: Raclette | Permalink. Okay, move over… this one is a winner! I will be making these for Christmas annually! They are very good. Plus they use Nutella (Chocolate Hazelnut Cream spread from Europe — I grew up with this stuff and to have a cookie that uses it is downright divine!) I found this recipe in America’s Test Kitchen’s Holiday Cookies 2010 issue. It was also featured as one of the winning cookie recipes last year that was submitted by readers. Yum Yum. Allow time for chilling the dough. I set out to make these and then after I had preheated the oven it said to chill the dough 1 hour to 24 hours. If you read my blog entry about Lemon Curd Cookies you know that Hazelnuts are sometimes hard to find. I found them at my Winco Food’s market, but Trader Joe’s does carry them from time to time if you are lucky enough to be near one. Combine the dry ingredients (flour, baking powder, salt) in a bowl and set aside. In a mixing bowl, beat the Nutella, butter and sugar until light and fluffy about 2 minutes. Add eggs, vanilla, instant coffee and mix until well combined. Reduce speed and add the dry ingredients and milk. Just until combined. Fold in 1/2 cup toasted chopped hazelnuts (oops I missed that and they turned out great anyway). Divide dough into 2 quart size bags and refrigerate for 1-24 hours. Adjust the oven racks to the two middle positions and preheat the oven to 375 F. Line 2 cookie sheets with either parchment paper or silicone mats (I love my silpats) Place chopped hazelnuts in one large pie dish and 1 cup of powdered sugar in another small bowl. Scoop 1 Tbsp of the chilled dough and form it into a ball. Roll the dough first in the chopped hazelnuts and then in the powdered sugar and then place them on the cookie sheet with plenty of space between them (about 2 inches between). I fit 12-15 on my cookie sheet (4 to 5 rows of 3). Bake at 375 for 10 minutes. Rotating the pans half way through and switching them in position with upper and lower sheets. Remove them from the oven and allow to cool for 5 minutes or so before removing the cookie to a wire rack to cool completely. These also freeze nicely! 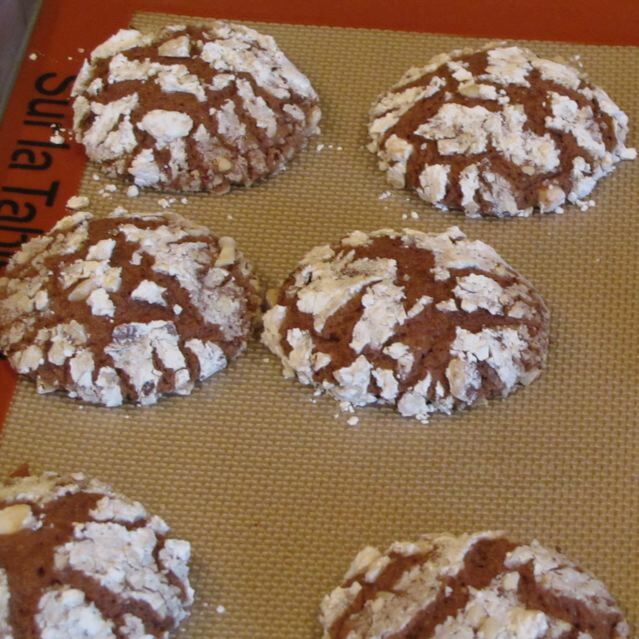 Categories: American Test Kitchen Recipe, Baking, Baking - Cookies, Christmas, Dessert - Cookies, Holidays | Tags: Christmas Cookies, Nutella Cookies | Permalink. I have wanted to make these for a few years now and this year I finally did. I found the recipe on allrecipes.com again. It is an easy to make cookie. The only change I made was that I used lemon zest instead of orange zest because I did not have any oranges in the house. They make nice and buttery cookies. Sift together dry ingredients and set aside. In a mixing bowl, mix the softened butter and cream cheese and beat until light and fluffy. Add the sugar, egg yolk and beat until light and fluffy. Stir in the vanilla and lemon (or orange) zest. Gradually add in the flour mixture a little at a time. Mix until combined. Load your cookie press and press the cookies (one trigger pull per cookie) onto an ungreased cookie sheet. Have the kids decorate them with sprinkles. Bake at 350F for 12-15 minutes until golden along the edges. Do not overbake them. Remove them from the oven and cool the cookies removing them onto a wire rack. Freeze for later use, or place in an air tight cookie tin for a few days. Categories: Baking - Cookies, Christmas, Dessert - Cookies, Desserts, Holidays | Permalink. Exhibit A: I made lemon curd for our church’s recent Christmas Tea and there was plenty left over to share with friends and I also find myself in possession of some! Exhibit B: I subscribe to Cook’s Country Magazine (published by American Test Kitchens) and their most recent issue (January 2011) had a recipe contest for cookies. 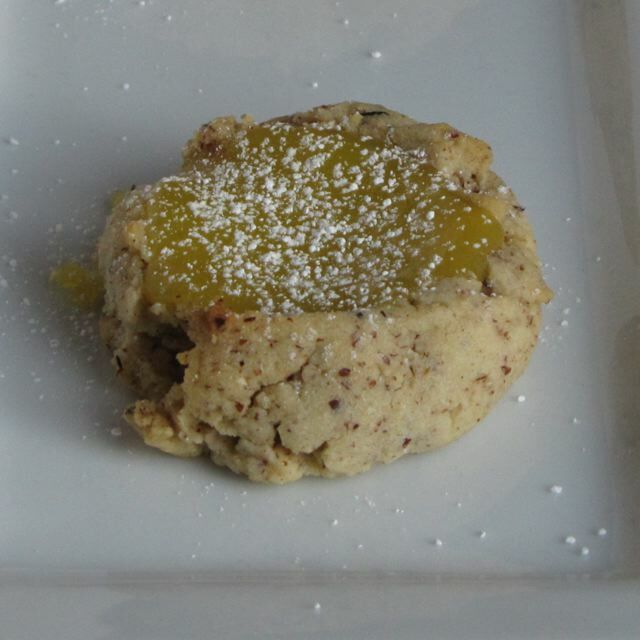 The winning cookie: Hazelnut-Lemon Curd Kisses. I just had to make them, because I have almost a half gallon of lemon curd to use up. I doubled the amount because 2 dozen cookies does not sound like a lot around my house! When I made them I used a small ice cream scoop to scoop the dough, but they made the cookies very large – in rereading the recipe it advises 1 Tbsp size measurements of dough. My doubled made 30 LARGE cookies, but the kids didn’t seem to mind. They are delicious! Place the raw hazelnuts on a cookie sheet and put them in the oven during the preheating process. When the oven is at temperature they will be toasted enough. I ground the toasted hazelnuts in a coffee grinder (the recipe called for a food processor with the flour and salt, but I only have a very small food processor, and this was just as easy). First I made sure all the coffee grounds were out by adding raw nuts to the coffee grinder and processing it and then wiping the coffee grinder out with a paper towel. I lined my cookie sheets with silicone sheets, but parchment paper will do the job nicely as well. To prepare the dough: Beat the softened butter with the 2/3 cup of sugar at medium speed in a large mixing bowl, and beat until it is light and fluffy about 2 minutes. Add the egg yolks and vanilla extract and mix to combine. Add the flour, ground hazelnut and salt mixture one third at a time. Mix on low until just combined and add more until the flour is combined. Scoop out the cookie dough and form into a 1 inch ball (mine were closer to 1 1/2 inches). Use the back of a (greased) spoon to make an indent. Bake at 350 for 10 minutes. Remove them from the oven and put about 1/2 teaspoon of lemon curd in each indent of the cookie. Return to the oven and bake for another 8-10 minutes or until the edges of the cookies are starting to turn golden brown. Remove from oven. 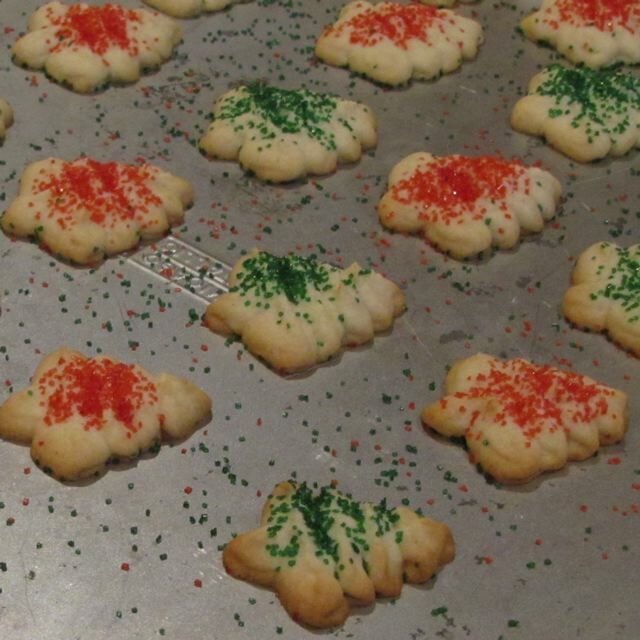 Allow cookies to cool on the cookie sheet for about 5 minutes before removing them to a wire rack to cool completely. Before serving. Dust with powdered sugar. Categories: American Test Kitchen Recipe, Baking, Baking - Cookies, Holidays, Lemon Curd | Tags: Cooks Country Hazelnut-Lemon Curd Cookies, Lemon Curd Cookies | Permalink.